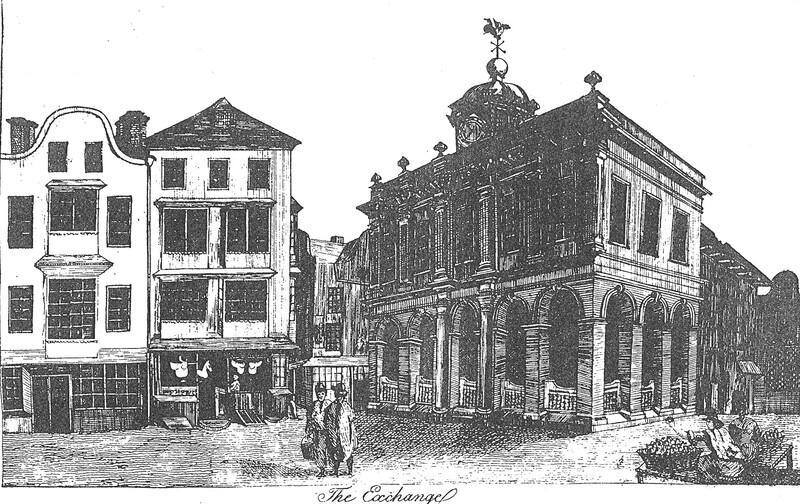 One of the most elegant additions to eighteenth century Cork was the Exchange or Tholsel, which was built on the site of Roches Castle (now the site of the Catholic Young Men’s Society hall on Castle Street). It was an important building of two stories. On its opening in 1710 the Council ordered the upper floor room be established as a Council Chamber with liberty for the Grand Jury of magistrates and landlords to sit. The lower part was used for commercial purposes. where a pedestal known as “the nail”, was used for making payments (still in existence in Cork City Museum). In later times the room was used for public sales. A figure of a dragon made of copper and gilt surmounted the cupola of the building as a weather vane. The Exchange declined as a market in time – through the erection of a Corn Market on the Potato Quay (popularly known as the Coal Quay) and improved facilities for the transaction of business offered to merchants. The central bell tower of the church of Red Abbey is a relic of the Anglo-Norman colonisation and is one of the last remaining visible structures, which dates to the era of the walled town of Cork. Invited to Cork by the Anglo-Normans, the Augustinians established an abbey in Cork, sometime between 1270 AD and 1288 AD. It is known that in the early years of its establishment, the Augustinian friary became known as Red Abbey due to the material, sandstone, which was used in the building of the friary. It was dedicated to the Most Holy Trinity but had several names, which appear on several maps and depictions of the walled town of Cork and its environs. For example, in a map of Cork in 1545, it was known as St Austins while in 1610, Red abbey was marked as St. Augustine’s. In the mid eighteenth century, part of the buildings of Red Abbey were used as part of a sugar refinery. This refinery was burnt down accidentally in December 1799. Since then, the friary buildings with the exception of the tower have been taken piecemeal. The tower is maintained by Cork City Council who were donated the structure by the contemporary owners in 1951 and also own other portions of the abbey site. Today, the tower of Red Abbey approximately thirty metres high is one of Cork’s most important protected historic structures. The remaining tower cannot be climbed but medieval architecture can still be on the lower arch of the structures and in the upper windows. The adjacent street names of Red Abbey Street, Friar’s Street and Friar’s Walk also echoes the days of a large medieval abbey in the area. The earliest and official evidence for settlement in Blackrock dates to c.1564 when the Galway family created what was to become known as Dundanion Castle. Over 20 years later, Blackrock Castle was built circa 1582 by the citizens of Cork with artillery to resist pirates and other invaders. In the early 1700s, the prominent Tuckey family, of which Tuckey Street in the city centre is named, became part of the new social elite in Cork after the Williamite wars and built part of what became known in time at the Ursuline Convent. 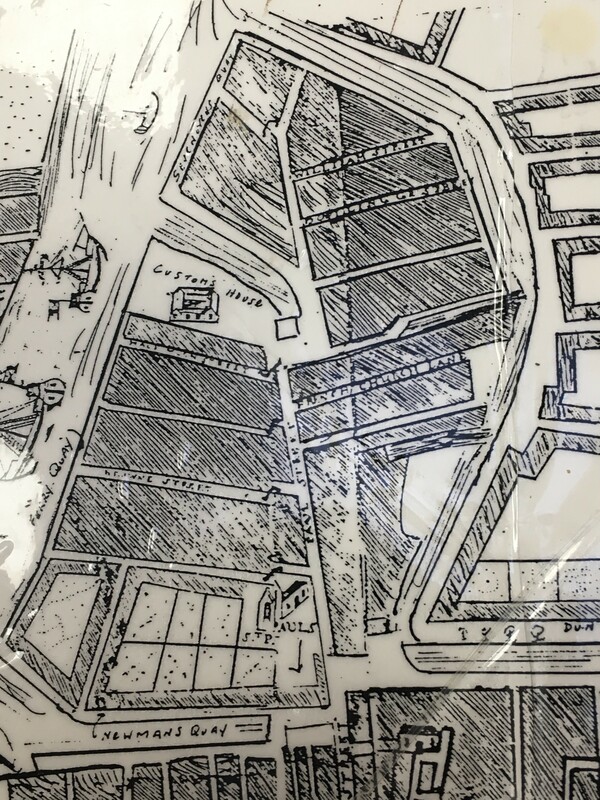 The building of the Navigation Wall or Dock in the 1760s turned focus to reclamation projects in the area and the eventual creation of public amenity land such as the Marina Walk during the time of the Great Famine. Soon Blackrock was to have its own bathing houses, schools, hurling club, suburban railway line, and Protestant and Catholic Church. The pier that was developed at the heart of the space led to a number of other developments such as fisherman cottages and a fishing industry. This community is reflected in the 1911 census with 64 fishermen listed in Blackrock.